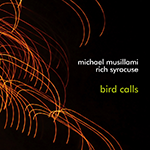 Playscape Recordings is proud to release Bird Calls, a duo recording of the music of Charles Mingus by veteran guitarist/composer Michael Musillami and master bassist and co-leader Rich Syracuse, a long-time member of the late baritone saxophonist Nick Brignola's Quartet. Bird Calls is Musillami's second recording with bassist Syracuse, following their 2016 collaboration Of the Night, recordings from the Wayne Shorter songbook, also released on the Playscape Recordings label. In their early years, both Musillami and Syracuse recall the introduction of the music of Charles Mingus as a heavy influence in how they framed jazz music going forward. Writes Musillami, "For as long as I can remember I've always referred to Mingus' writing and arranging style as a guidepost for what I can possibly add or imply in my compositions." Syracuse adds, "Even at the young age of eight years old I heard the seriousness, the swinging, the improvisation and the brilliance of Charles Mingus. This album is not a tribute to Charles Mingus as much as it's an exploration of his music." This latest release documents personal interpretations of Mingus' "Opus 3", "Goodbye Pork Pie Hat", "Boogie Stop Shuffle" and the titular and beautifully melodic "Bird Calls". "Free Cell Block F", "‘tis Nazi USA", "Nostalgia in Times Square", Carolyn Kiki Mingus and Duke Ellington’s "Sound of Love" are also included in the set list. Bird Calls was recorded by master engineer Nick Lloyd at Firehouse 12 in New Haven, Connecticut.